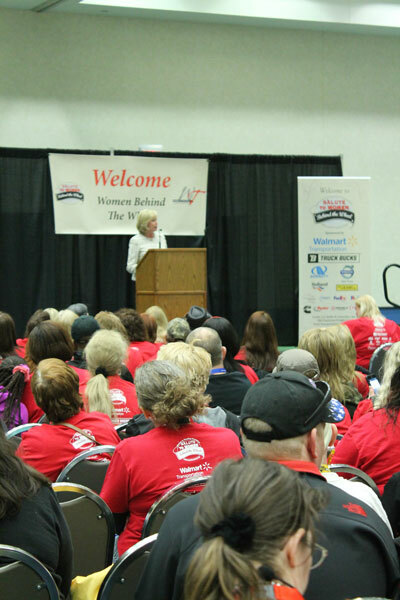 The Salute to Women event is the brainchild of Ellen Voie, President/CEO of the Women in Trucking Association (WIT) and her long time colleague Char Pingel, WIT Special Events & Publications. Six years ago, the dynamic duo decided there ought to be an event that honors and celebrates the dedication and passion of professional women truck drivers in our country. Since TrucBrush Corporation was one of the sponsors this year, I was fortunate enough to share the day with 201 CDL drivers, their co-workers, friends and family members. As part of the event, WIT’s Foundation worked to raise money for the scholarship fund to help women advance their careers in trucking. This was my first year volunteering for the WIT Foundation and I found myself wrapped in red Staples donation tickets, trying to count and tear them off fast enough to accommodate the generosity of 400 plus attendees. We raised over $2,500 dollars in what seemed like minutes. That’s the thing I’ve noticed most about people who work in the trucking industry—they support each other—not only financially but with their time and knowledge. Over the year’s I’ve attended many industry type award celebrations, but nothing prepared me for the energy of the Salute to Women in Trucking. 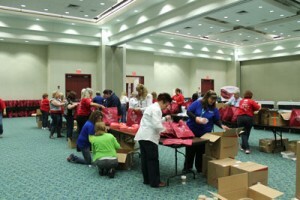 What participants didn’t see was the approximately 50 volunteers who assembled prior to the event to prepare attendee ‘goodie bags’ chock full of donations from sponsors and the WIT. Smiling and moving with exceptional speed, the volunteers worked in unison. Nor did we witness the long hours and dedication of the WIT staff to make this event a reality. 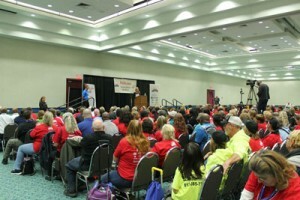 What we did see was a sea of red shirted WIT Salute to Women drivers and some 400 attendees, both women and men, who waited in anticipation for Ellen, an industry leader with her own high octane enthusiasm for the trucking industry, to step to the podium and kick start the day. The event was streamed live so those who could not attend in person could experience it from home. Ellen called to the stage Marcia Taylor, President of Bennett International Group and the 2014 Influential Woman in Trucking. Marcia addressed the audience with praise and advice, “I knew that as a women I would have to work to gain respect in the industry, by being both strong and the best I could be. You are to be congratulated for the job you do, the challenges you face as a women driver, and the important role you play in our business and the economy of our nation,” Taylor added. I was moved by Taylor’s speech; how she found herself running the family’s trucking company after the early and unexpected death of her husband. Her admiration for her own drivers who she identified in the room was palatable. Tears where shed, including my own, as she spoke honestly about the challenges she, her family and the many women in the trucking industry face on a daily basis. 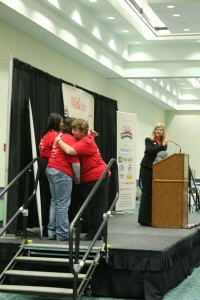 As the day’s speakers and award ceremonies continued, cheering from the audience became commonplace. 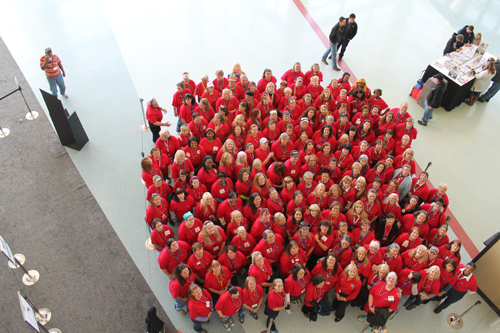 Companies, such as Walmart and Ryder, brought their finest female drivers to be recognized for their outstanding safety records. Then Ellen did the unexpected. She asked women who had been driving a truck for 6 months or less to stand and a handful did. Then she directed the other drivers “to look for them out there and help them.” Ellen asked those with over 6 months and up to 5 years to stand…then 5 to 10, 10 to 20 and so on. She then asked the female drivers in each experience category to sit down until three women were left standing. They represented the women with over 40 years of driving experience. These women were brought to the stage to say a few words and be honored. It was a spontaneous moment and one veteran driver ended with the thought that we need to support each other, regardless of gender, “because when you get into the seat of a truck, the truck’s steering wheel doesn’t know whose hands are on it, and it doesn’t care.” Nor should we. 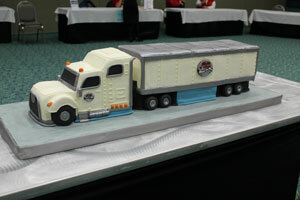 For the 3.5 million professional men and women truck drivers in the United States, TrucBrush Corporation salutes you! Welcome to our Blog Page. We will be posting current news and events on a regular basis. Please check in with us at anytme. The TrucBrush™ concept was born when Jim Burns was challenged to come up with an alternative to the increasingly costly and dangerous approach to solve a staple problem in the trucking industry, namely the safe and efficient removal of snow from the rooftops of trucks.